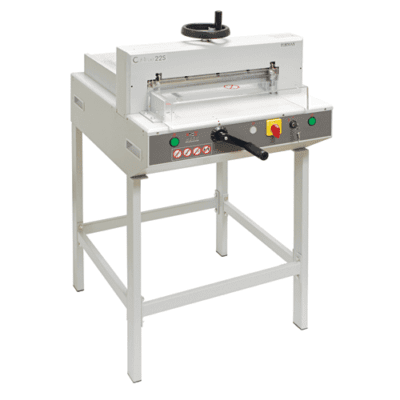 The Cut-True 22S Semi-Automatic Electric Cutter offers precision cutting for paper stacks up to 16.9” wide. This semi-automatic cutter requires very little effort, thanks to its electronically-controlled two-button operation. Simply load a stack of paper, up to 1.77” high, secure with the geared clamp, and press the buttons to engage the hardened-steel Guillotine blade. Accurate cutting is easy with its spindle-guided back gauge with LED digital readout and calibrated scales. Using these and the LED Laser Line, operators can make fine adjustments, and see exactly where the blade will cut. The 22S doesn’t sacrifce safety for accuracy. In fact, it features an electronically-controlled front safety cover, transparent rear cover, safety lock with key, blade lock, external blade depth adjustment, easy blade change access from the front of the cutter, and a wooden paper push for safe alignment. The rugged metal stand is included, providing a stable work surface, as well as feet for tabletop use. The Cut-True 22S is ideal for transforming brochures, invitations and more, with crisp, accurate cuts, and makes a welcome addition to print shops and in-plant finishing operations. Key FeaturesQuick and accurate. Electronic two-button operation. Cuts stacks up to 1.77" H. LED cutting line. Various safety features.